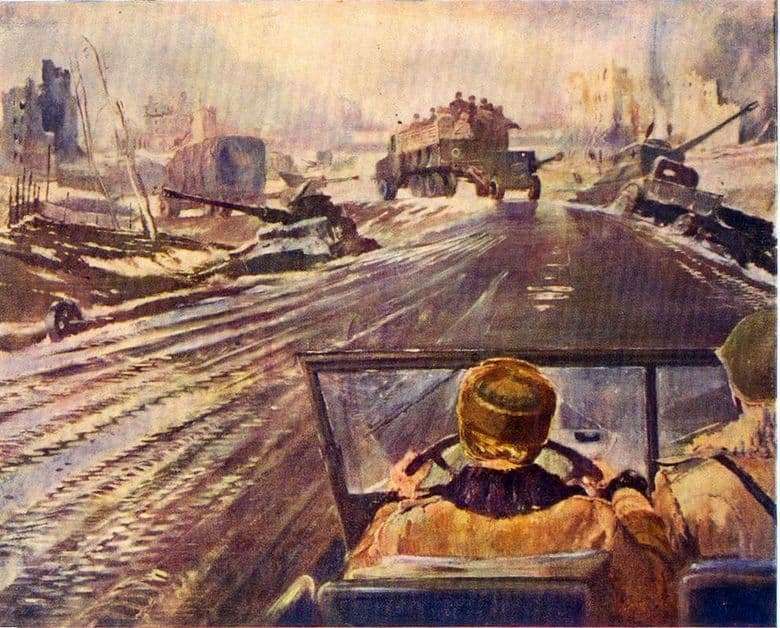 The famous Russian artist Yuri Pimenov approximately a year before the end of the Great Patriotic War creates an almost vivid picture called “Front Road”. Just a couple of years before, the author had written another well-known work called “New Moscow”, which very closely intersects with the wartime picture and depicts the same action of the main character, changing only the surrounding background. In these two paintings, the artist paints the girl at the wheel from this angle, as if we were driving with her in a car and watching what was happening. In “New Moscow” Pimenov demonstrates his vision of the future in the city, but after the beginning of the tragic era in world history, the artist paints the picture “Front Road” showing us the same city, crushed and plundered by the Nazis. The girl behind the wheel of the car, apparently, leads a conversation with his military companion, discussing what is happening around. Past them passing large trucks carrying crowds of soldiers, on the side of the road is a broken vehicle. If you look at the details, you can see a column of smoke from the houses encountered along the way. Based on these details, there comes a clear understanding that in the picture the artist depicted an indescribable atmosphere immediately after the battle. Yury Pimenov in his famous work “Front Road” very accurately caught the spirit of wartime, passing us the emotions of this truly difficult period in the history of Russia and the whole world. The panorama of the destroyed city, which in the previous picture “New Moscow” radiated a bright and happy future, makes us shudder at the unpredictability of terrible changes. Beautiful new houses, expensive cars and crowds of people, hurrying about their business, were replaced by destroyed buildings, broken military equipment and the emptiness around.